← BHLR: Make Your Views Known – Deadline Approaching! The Hastings Alliance for Sustainable Transport Solutions is a coalition of local and national groups originally formed over 11 years ago to oppose the construction of the Bexhill and Hastings bypasses and to promote alternative and sustainable strategies for the two towns. More recently we have focused our attention on the BHLR. We have never believed that the BHLR would solve congestion, deliver sustainable development or regenerate Hastings and Bexhill. We have always known that it would destroy the landscape, ecology and cultural heritage of the Combe Haven valley. We therefore urge you not to support this scheme, but to encourage the East Sussex County Council to abandon its single minded obsession with this road and look finally for better and more sustainable ways of achieving their objectives. In responding to ESCC’s Best and Final Bid for funding for the road we have commissioned reports (attached) from Professor Alan Wenban-Smith of Urban and Regional Policy and Mr Keith Buchan of MTRU, both of whom participated with us in the Public Inquiry into Compulsory Purchase and Side Road Orders for the BHLR. We have also asked our associate Dr Judy Clark, former Senior Research Fellow, Department of Geography at University College London, to comment on the value of Landscape Impacts included in the BHLR BCR. Broadly speaking Professor Wenban-Smith and Mr Buchan conclude that the scheme does not achieve its strategic objectives, fails to meet statutory carbon targets, and is likely to provide extremely poor value for money. The landscape impact is greatly understated – Dr Clark’s report details this. A package of viable alternatives has never been looked at properly or tested in depth and the connecting roads to allow exploitation of land at North Bexhill for both house building and a business park are not even included in the funding bid at this point, but are planned for 2013/2014 and 2021/2022 subject to developer financing, which is admitted to be unlikely. The road therefore limits itself to relieving congestion on the A259 by redistributing it into other areas of the towns. In fact both personal observation and traffic figures given by the Eddington Transport Study of 2006, show that congestion on the Bexhill Hastings section of the A259 puts this road way down the league of congested UK roads. Finally ESCC admits that 97% of this traffic is local between the two towns and a good deal of it is unlikely to change route. The MTRU study analyses the BAFB document following the DfT 5 Cases process, classifying elements of each Case using the Red-Amber-Green code. Greenhouse gas, Environmental capital, Economy and Health in the Strategic Case section all earn a Red label. Its view of the Economic and Financial Cases is equally negative. The issue of alternatives was prominent in the DfT’s initial presentation for the Pool process. The cost of an alternative sustainable transport package is significantly less than the ESCC is committing towards the road scheme and would provide far greater value for money. In discussing Landscape valuation MTRU argues that far from ESCC’s position that the DfT value of £76.13 is too high, this figure cannot be said to be the complete damage cost, based as it is on a ribbon of land of only 500 mts. on either side of the road. The proposed road splits the valley, destroying landscape and important habitats over a much wider area and should be valued at much closer to Dr Clark’s figure of over £120 million. This is a unique environmental and therefore economic asset of Bexhill and Hastings. Importantly there is a statutory duty on local government not only to protect but to enhance biodiversity. Planned, so-called mitigation does not fulfil this duty adequately. It must not be forgotten that the previous Hastings bypasses proposal was rejected by the then Minister because in his view the environmental damage it would certainly cause outweighed the unproven economic benefits. Has anything changed in the last decade? On strategy, the Urban & Regional Policy report notes that the BHLR unbalances the 5 Point Plan’s package of regeneration action and contributes little to the local economy, while continuing and increasing car dependency. The transport proposals as a whole do not take seriously the need to reduce and rebalance transport demand. The transport capacity to meet the needs for regeneration, employment and housing, can and should be met in other ways. The high percentage value (84%) of time savings within the economic case is a controversial issue. Professor Wenban-Smith argues that the very localized nature of the BHLR’s impact and therefore shortness of time saved, compounds this and tends to overstate the BCR. The local nature of the road, admitted by ESCC, limits the appeal to outsiders of the proposed North Bexhill Business Park. This development was at one time one of the key reasons for building the road. It now seems likely that the majority of potential users would come from within the two towns, vacating existing premises. No mention of revenue from the NEBBP appears in the BAFB Economic Assessment report and indeed no funding for the necessary access road is included in the BAFB. Access to proposed housing also depends on connecting roads. ESCC has stated that given the potential cost of these connections, housing development is not viable. So, an expensive road at an economically very difficult time; an environmentally devastating road at a time when we are starting to value our environment properly; a road which leads to nowhere, is unlikely to provide many new jobs, and which in any case apparently cannot reach the areas it needs to reach (new houses and a business park) without significantly more money, which ESCC themselves do not know how to find. Does this make any sense? Furthermore today, October 14th is the anniversary of the Battle of Hastings and a new book is being published (www.secretsofthenormaninvasion.com) which claims with some authority and years of research behind it that the real site of the battle is none other than the Combe Haven, about which we are so concerned. Hastings Alliance supporters in their thousands reject this road. Nearly 700 postcards collected in only 3 weeks and to be delivered to Great Minster House today represent only the tip of this iceberg. On Friday the 14th October – deadline for submissions to the Department for Transport on the East Sussex County Council ‘Best and Final Funding Bid’ to government for the Bexhill to Hastings Link Road – a box of postcards was delivered to the Department. In the box, were 630 postcards from local residents, some from other parts of the county, and some from further afield – including from two Dutch tourists visiting Hastings. A further 20 cards had arrived by post. The cards urged Norman Baker, MP, not to grant government funding for the scheme. Collected in just three weeks following the Rally in the Valley, the cards gave people the opportunity – eagerly grasped – to have their say on the future of their locally cherished place. In a surprising number of cases, those signing up knew little about the BHLR, a reflection perhaps of a lack of information and consultation. The last consultation, a flawed exercise asking little more than ‘Which route do you want for the road?’, took place in February 2004, eleven and a half years ago. A number of children on the Rally in the Valley weren’t born then. The presentation of the postcards to DfT officials was a cordial affair and they expressed their appreciation of the ‘personal delivery’. 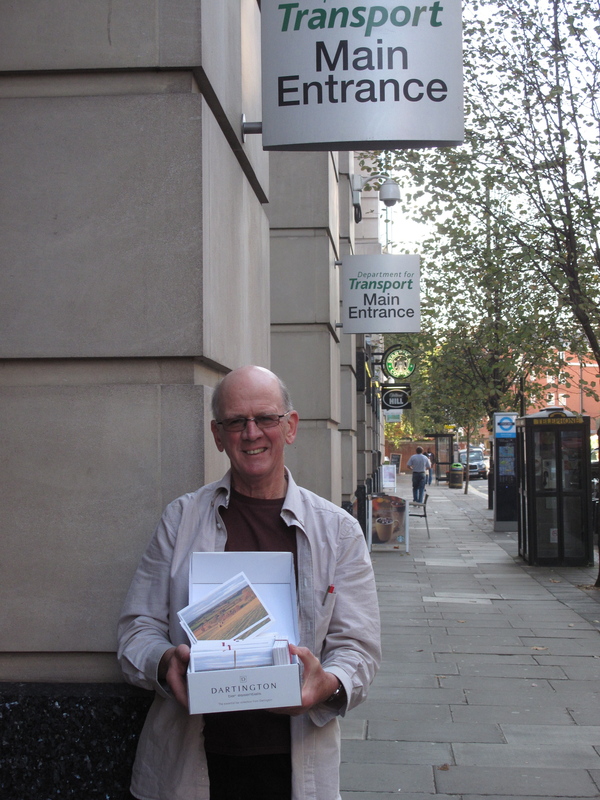 They were also presented with photos of the valley in all seasons, including an album originally put together for the 2009 Public Inquiry, and copies of Crowhurst poet Brian Moses’ poem ‘Empty Places’, illustrated by Hastings Artist Nigel Harvey. Importantly, DfT officials have themselves visited Combe Haven. Of course, many written submissions have also been received by the DfT from Alliance individuals, organisations and Alliance members, and below is the ‘covering’ submission from the Hastings Alliance. A link to environmental permits heritage and nature conservation. If DEFRA have approved the activity we can also apply to have that permit revoked. Eco tort is also very appropriate http://ecotort.blogspot.co.uk/ as it provides the legal basis for preventing and stopping environmental destruction. Sustainable infrastructure as you suggest is the critical factor.